Dream....it is the perfect time of year for dreaming, don't you think? Love it! No one should ever stop dreaming. Thank you ma’am….and I agree!! Thank you so much! :-) Short depth of field helps the lights to look blurry and “dreamy”! Hugs!! I agree-Dream big and Dream always! Thank you so much Su! I got a pair of these at HomeGoods a few months ago...perfect for coffee or hot chocolate! Hugs! Beautiful! And I love the sentiment :) I hope you are finding time to relax and enjoy the season...and dream! Thank you so much Julie! I hope you and your family are enjoying the season also and dreaming as well! I'm dreaming of that mountain cabin and about 3 feet of snow....LOL Love and hugs to you sweet friend!! What a great idea!! There is a movie “Silent Night” that I just love! What a great song! I’ve not ever heard it before…thanks so much for sharing! 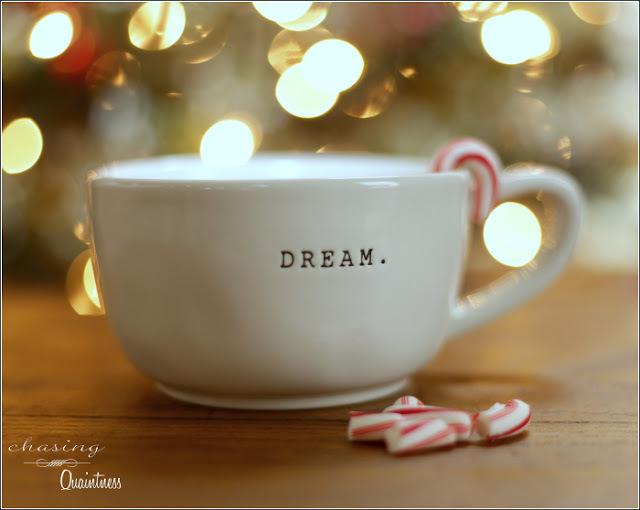 And yes, we all need a Christmas Dream! Thank you so much Rebecca! Merry Christmas to you also! Hugs! You are so welcome! Have a wonderful evening! Hugs! Yes! and right now I am dreaming of a white Christmas! you've captured the magic and feel of the season. Thank you so much Miss T! I hope your week is off to a wonderful Christmas start! Love and hugs to you! Thank you Sherry! Merry Christmas to you too! That's lovely and thank you! I hope you and your family have a Merry Christmas also! Hugs! !